The place to report and discuss your experiences of owning and riding the Strida. Perhaps your first impressions, or your story of a big trip. Hey All - just though I'll share what I been riding. After purchasing this Strida EVO for a full year - I fell in love with it again and been riding on average 40km +/- as part of my get out of the apartment and get fresh air. I actually came from a BMX background and am so used to standing on the pedals - espically when cycling hard... so it took me a while to retrain myself on how to ride the Strida. It certainly is a different bike experience - one that I am really pleased with now. Below my Strida EVO - this was purchased from Hello Bicycles - the Strida distributor in Singapore. This is my usual run of the mill ride in the mornings - in this case just shy of 40km. Easy ride. Probably can go on much further if I had more time. I would really like to dispel any myths that Strida's are short distance bikes as the EVO model totally changes this. Below is a screen grab from my iphone app iCardio - which I link with a heart rate monitor. 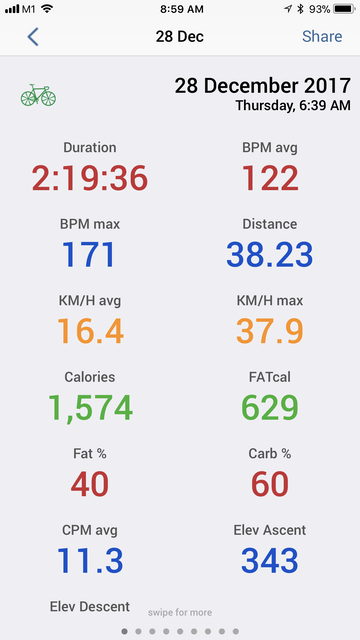 Distance is 38.23KM / 1,574 calories burned / 2hr 19min ride. Last edited by Willie on Thu Jul 12, 2018 12:52 pm, edited 1 time in total. 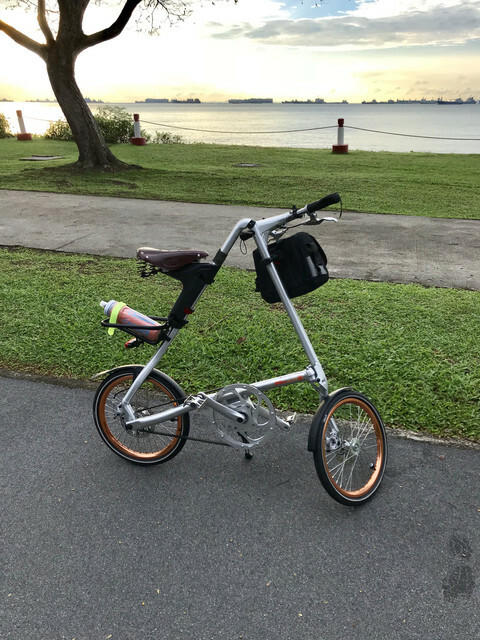 Willie wrote: ...I actually came from a BMX background and am so used to standing on the pedals... so it took me a while to retrain myself on how to ride the Strida. very good that you accepted - and followed - this Strida advice! I believe the main reason for this restriction is the simple reason that the rear hinge and the locking mechanism are too weak to withstand an overstressing (by torsion) created by stronger riders plus standup pedaling. In your case it can't be wrong to inspect both bolts (Strida part number 274) left and right of the locking mechanism frequently for tightness. Please do not attempt to ride the bike with a loose bolt - never. Note that - if you secure the frame tubes in folded position by "crossing" them - the belt tension will increase. But anyway I'd recommend the frame clip - it will help unburdening the rear joint. Blackstridaaustria wrote: very good that you accepted - and followed - this Strida advice! Yes - took me a year to finally re-train myself - every time I saw an incline I had this HUGE impulse to "stand and pump the pedals for power" like I would for a BMX (1 speed) bike. I also own a folding 1-speed - and broke 2 pedals in a period of 6 months - so this kinda shows how much of a mad "standup rider" I am. Anyway - took 1 year -- probably could had been a few days if I had tried to use the Strida EVO. The purchase itself for me was an impulse buy as I live in a small apartment and the fact it is like a standing umbrella was the SELL POINT - it was BUY BUY BUY - and later I had buyer's regret when I had issues "doing the BMX stand thing" so I left it to gather dust in a small corner for almost a year --- till I gave it new love and I am SO McLoving it now!!! Thanks for mentioning the Frame Clip. I DID NOT know about this NOR did I ever receive this when I purchased the bike. I was told to cross them - had been doing that for a YEAR! I just checked your link and it's $5! =) Postage to Singapore will cost more --- no doubt I will find something exciting to also buy with that from Bill @ Strida Canada. My local Strida shop does not stock this. THANKYOU SO MUCH for this advise! I am new this forum... although it is a bit quiet - I appreciate all these advise. 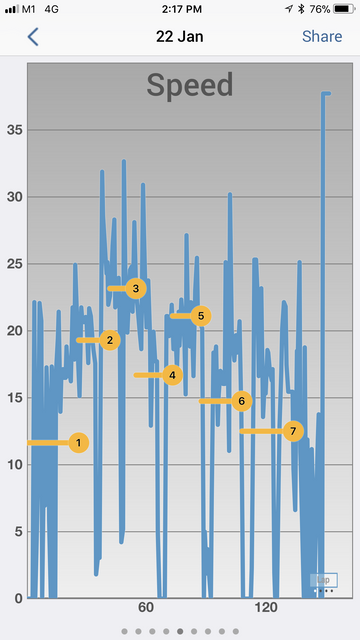 So this is my speed graph - so this is my approx 40km ride. The EVO easily clears around 18 to 25km/hr. It's > 2 hours ride - some stops (traffic lights, drink stop, etc). Throughout most of this ride - I am on top gear. I sometimes wished the EVO had a 4th gear But then that would make the hub difficult to use (?). IMO - the 1st gear is not useful unless you are doing 45 degree incline hills! Personally, I don't think it'll be much more complicated to switch in 90° degree steps instead of 120°. But there is no room inside of the gearbox to add a fourth gear pair that easy - I guess that is the bigger problem. These again are, due to their 40er width, 6 mm bigger (in diameter) than the biggest suitable 355er tyre and they would raise the gear ratio for ~ 3 %! - Finally it seems that in the near future we'll get an alternative drive for the Strida! Of course I'll report about it asap. Hej p0pa...patience is not your style, hmmm? A single speed Strida has a 100 (physical) teeth beltwheel. Dual speed Stridas have an 80 teeth wheel - and a virtual one with 132 teeth. The three speed EVO has a 100 t beltwheel and two virtual ones - with 79 and 126 t.
Correct and comprehensible so far? An alternative drive could use the 80 teeth wheel - and might have 114,4 and 143,2 virtual teeth. Blackstridaaustria, that sounds very much like Triple speed Strida, doesn't it? I was very close to buying an EVO but now I am hesitant if I should wait a bit. Yes, like EVO, but different gear ratios. Blackstridaaustria wrote: Yes, like EVO, but different gear ratios. hey BlackStridaAustria - I don't quite get this. How reliable is this inside info? And another multi 3 speed Strida but with different gear ratios? I assume it's a refinement model for Strida EVO -- as in a model 2? Would not make sense to have 2 Strida models with 3 speeds on the market. The forum pm box is accessible, after logging in, via the button "New Messages" at the upper left corner of the forum window, next to "User Control Panel".